The Villas at Deep River Plantation is a resort-style townhome community that welcomes residents of all ages. All exterior maintenance is provided, and homes here feature fine appointments and award-winning designs. Homebuyers can select from resale construction homes. The Villas at Deep River Plantation is planned to comprise 116 residences. The townhomes boast open floor plans, walk-in closets, gourmet kitchens and custom touches throughout. Each building combines four units so that each looks like a spacious single-family dwelling from the street. The Villas at Deep River Plantation has a well-maintained resort-style clubhouse and pool with a patio area. Here, residents come together to play cards, watch the big game, participate in pool tournaments and have poolside cookouts. Its swimming pool has waterfalls and is heated in the spring and fall. Other desirable features of the pool area include outdoor showers and outside access to the community restrooms. The clubhouse has an exercise room with a private entrance. Residents can utilize its treadmills, free weights, recliner-exercise bike, elliptical machines and jump ropes while watching Cable TV. There is a spacious multi-purpose room that includes a cozy fireplace, billiard and game tables, comfortable seating, piano, library as well as a TV and sound system. Residents also have use of a catering kitchen complete refrigerator, dishwasher and microwave. Six floor plans were designed for this active lifestyle community where homes are about 1,400 to almost 2,000 square feet. Built by Epcon Communities, these attached homes have two-car garages as well as a minimum of two bedrooms and two baths. While one design has an upstairs loft and another a lower level, all plans center on main-level living. In both layouts the extra areas can function as guest suites, play areas or offices. The interiors of all homes have high vaulted or cathedral ceilings and let in plenty of natural light. Epcon is especially known for its open and inviting great rooms, which set the tone for the entire living space. The Villas at Deep River Plantation offers a carefree lifestyle among the natural beauty of streams and extensive green spaces. Residents enjoy the convenience of townhome living without the hassles of trimming shrubs, cutting grass or shoveling snow. Homes reflect pride of ownership and have beautiful curb appeal. Since buyers can select from a wide array of options and designs, homes here suit almost any individual lifestyle. 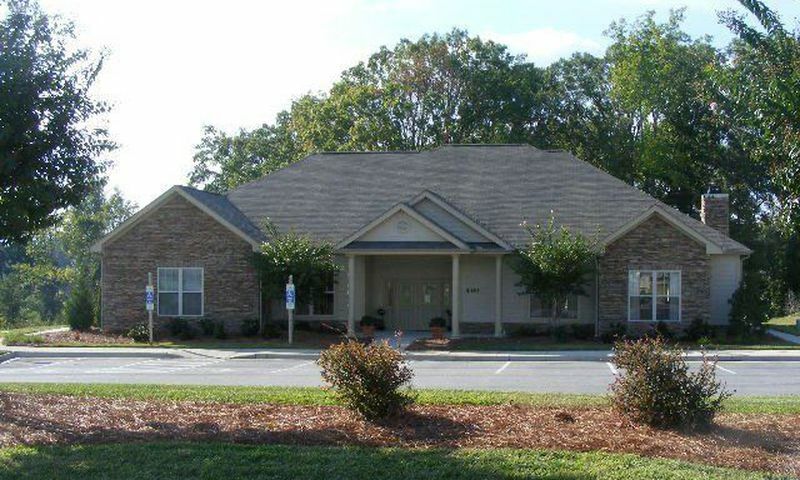 It is easy to meet neighbors and make friends at The Villas at Deep River Plantation as residents often come together for banquets, holiday celebrations and private clubhouse parties. Popular activities include water aerobics, wellness class, pinochle, bowling, and more. Residents of The Villas at Deep River Plantation are within minutes of the Greenway Hiking Trail as well as stores and restaurants. Popular shopping centers in the area include The Shoppes at Wendover Crossing, Palladium Shopping and Movie, and the Oak Hollow Mall. The area also boasts plenty of symphonies, movie theaters, operas and spas. Recreation opportunities abound with a variety of golf courses like Oak Hollow Lake and Jamestown Park. Other popular destinations in the area include the Asheboro Zoo, the Natural Science Center of Greensboro, The Bog Garden and the Tanger Family Bicentennial Garden. Owning a home within The Villas at Deep River Plantation means living in a convenient area close attractions as well as to family and friends. There are plenty of activities available in The Villas at Deep River Plantation. Here is a sample of some of the clubs, activities and classes offered here. The attached homes inside of The Villas at Deep River Plantation are built in quad formations with 1,400 to 1,900 square feet of living space. Homebuyers can select a new or resale home designed by Epcon Communities. Every home has at least two bedrooms, two bathrooms, and an attached garage. 55places.com is not affiliated with the developer(s) or homeowners association of The Villas at Deep River Plantation. The information you submit is distributed to a 55places.com Partner Agent, who is a licensed real estate agent. The information regarding The Villas at Deep River Plantation has not been verified or approved by the developer or homeowners association. Please verify all information prior to purchasing. 55places.com is not responsible for any errors regarding the information displayed on this website.